Old Navy has a Thank You Event on now! 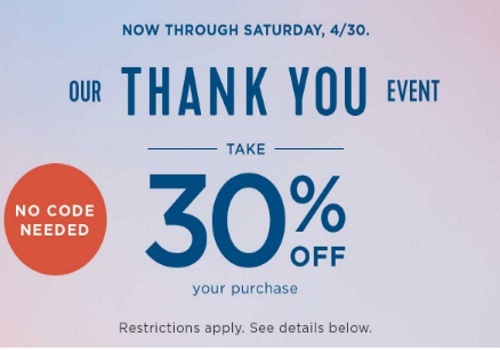 They are offering 30% off your entire purchase in-store and online with no promo code required. They are also offering a promo code for 40% off one item of your choice (online only) with the promo code YOURPICK. Please note, Old Navy also sent out subscriber emails for a 40% off your entire purchase promo code which ends April 30 as well (this one is in-store only, we blogged it while it was online until April 27 earlier). These offers are valid until April 30, 2016.